We’ve heard the rumblings, too. With all this precipitation, and more cold temperatures to come, and now news reports with the word “snow” in them, could there perhaps maybe perchance might possibly be snow in Los Angeles on Christmas Eve? Turns out, yes, if you live high in the mountains, but, no, if you live anywhere else. National Weather Service meteorologist John Dumas says there is a system moving in Friday night and early Saturday morning (Christmas Eve) that has the potential to bring rain and snowfall down to elevations of 3,500 feet, which would affect roads and communities in the mountains in Ventura County and northern Los Angeles County, as well as on I-5 in The Grapevine area. The Santa Monica Mountains would not be affected. Angelenos can expect chilly temperatures (with lows in the 40s) over the holiday weekend. Ken Clark, an expert meteorologist with Accuweather, advises anyone spending Christmas in Big Bear or any of the ski communities to bring chains for their tires, with rain and 6-10 inches of snow possible at elevations 6,500 feet and up. Clark said he can’t recall there ever being a white Christmas in Los Angeles. Snowfall lasted nearly three days and varied by location; barely a third of an inch fell on the L.A. civic center, where official measurements were made, but nearly a foot fell elsewhere. Snow blanketed beach cities from Santa Monica to Laguna. Nighttime temperatures dipped into the 20s. 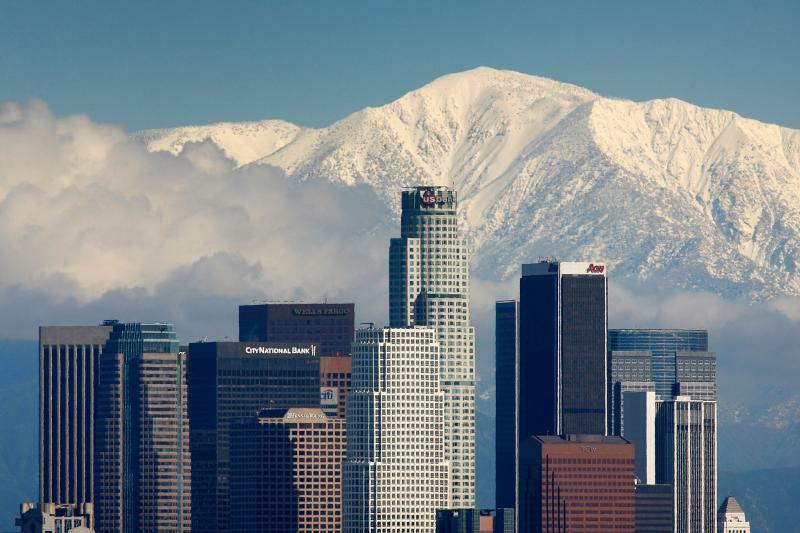 The last time Los Angeles recorded snowfall at low elevations was January 17, 2007, when a rare light dusting fell in West L.A., the Valley and Malibu, leaving enough snow on the ground for children in Westwood to make a snowman. Next articleMeet the Artist Whose Quirky Illustrations Are Popping Up All Over L.A.